Angelina Jolie has been gracing the big screen for over two decades. From Girl, Interrupted to Mr. & Mrs. Smith, from Lara Croft: Tomb Raider to Wanted, and from Changeling to Maleficent, she's established herself as an icon within pop culture history through a wide range of roles. Over the span of her impressive career, this multi-hyphenate has become one of Hollywood's highest-paid actresses and has boasted a number of accolades, including an Academy Award, two Screen Actors Guild Awards, and three Golden Globes. While the movie star has continued to keep busy, we have to admit she's been pretty quiet lately. From health scares and a busy family life to humanitarian work and taking on roles behind the scenes, there's actually a lot about Jolie's life and career that even her most devoted fans may have missed since she last appeared on film. So, let's answer the question on everyone's mind: what's the real reason Jolie hasn't been on the big screen recently? Jolie set her sights on her feature directorial debut with 2011's In the Land of Blood and Honey. She also wrote the script, which centered on a love story set against the backdrop of the brutally violent Bosnian War. Critics praised the director's ambitious undertaking in raising awareness about the '90s conflict. However, the movie itself received mixed reviews. While The Hollywood Reporter noted, "[Jolie] deserves significant credit for creating a powerfully oppressive atmosphere and staging the ghastly events so credibly," Variety felt her "dramatically misguided attempt…springs less from artistic conviction than from an over-earnest humanitarian impulse." Following a limited release, the drama received a Golden Globe nomination for Best Foreign Language Film, but ultimately failed to make a splash at the box office. Unfortunately, Jolie's follow-up effort, Unbroken, suffered a similar fate in 2014. While the WWII drama performed better at the box office internationally, it garnered mixed reception. Following a three-year hiatus from acting, Jolie returned to the big screen in 2014's Maleficent. The movie, which offered a feminist re-imagining of Disney's Sleeping Beauty from the antagonist's point of view, became an undeniable blockbuster hit. Earning more than $758 million internationally, it was not only the fourth-highest-grossing movie of that year, but has also remained, at the time of this writing, the highest-grossing film of Jolie's career. The A-list actress' performance earned overwhelming praise from critics. However, the movie itself received mixed to negative reviews. With a tepid score of 50 percent on Rotten Tomatoes, the site's general consensus read, "Angelina Jolie's magnetic performance outshines Maleficent's dazzling special effects; unfortunately, the movie around them fails to justify all that impressive effort." Despite its massive commercial success and the critical momentum stemming from Jolie's strong performance, the movie failed to garner much recognition during awards season. Jolie began to suffer from a number of heath scares during the early 2010s, which forced her to make her well-being a priority. After learning that she was at high risk for breast cancer, she underwent a double mastectomy as a preventative measure in 2013. "I do not feel any less of a woman," she wrote in an op-ed for The New York Times. "I feel empowered that I made a strong choice that in no way diminishes my femininity." Two years later, her doctors noticed possible signs of ovarian cancer, leading her to also have her ovaries and Fallopian tubes removed. In 2017, Jolie revealed to Vanity Fair that she'd been diagnosed with Bell's palsy and hypertension. However, she has no regrets about the measures she took to deal with her health problems. "I actually feel more of a woman because I feel like I'm being smart about my choices, and I'm putting my family first, and I'm in charge of my life and my health," Jolie told the magazine. "I think that's what makes a woman complete." Jolie and her ex-husband, Brad Pitt, seemed to share a perfect union for nine years before they finally married in a secret ceremony in 2014. But a mere two years later, the actress filed for divorce, and Brangelina was suddenly no more. The highly publicized drama stemming from their split not only threatened to overshadow Jolie's work, but also forced the mom-of-six to focus much of her time and energy on her family life rather than her professional endeavors. The decision to call it quits followed Pitt's infamous on-flight argument with the former couple's eldest son, Maddox, and resulted in a nasty, ongoing custody battle. But as Jolie revealed on The Hollywood Reporter's Awards Chatter podcast the following year, a number of outside factors, including her health problems and the death of her mother, had already put a strain on their marriage. "None of it's easy. It's very, very difficult, a very painful situation, and I just want my family healthy," Jolie told The New York Times in 2017, adding, "They're getting better." If critics were enchanted by Jolie's take on Maleficent, the spell was decidedly broken by the time she released By the Sea the following year. The multi-talent played triple duty on the 2015 film, while writing, directing, and starring opposite Pitt for the first time since Mr. & Mrs. Smith a decade before. The marital drama was panned by critics, and received a low 34 percent score on Rotten Tomatoes. While Rolling Stone slammed it as a "vanity project," The Washington Post claimed the "lackluster" film offered "nothing but emptiness, sprinkled with stilted sentiments." Unfortunately, the lead actors' joint star power wasn't enough to overcome this negative criticism. After receiving a limited release, the film flopped at the box office. 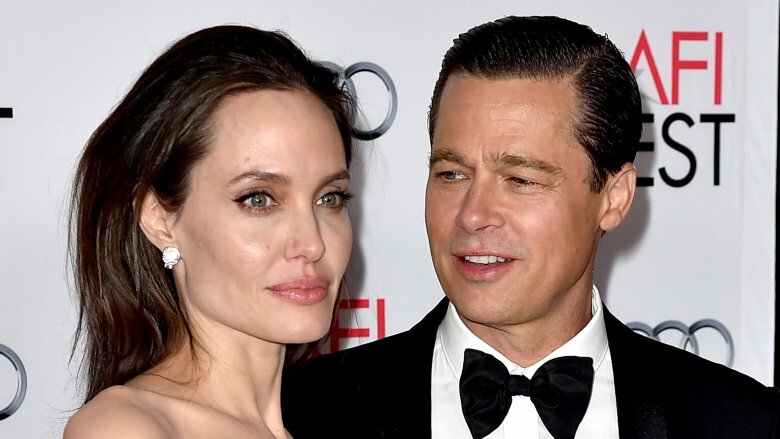 "I'm glad [Brad and I] did that film because we did explore something together," Jolie said on the Awards Chatter podcast, while revealing that she'd made the film with the hope of saving her crumbling marriage. "Whatever it was maybe it didn't solve certain things, but we did communicate something that needed to be communicated to each other." While in the thick of divorce drama, Angelina Jolie navigated her difficult breakup by focusing on the former couple's six children: Maddox, Pax, Zahara, Shiloh, Vivienne, and Knox. However, this adjustment to single motherhood wasn't necessarily easy on the Jolie-Pitt clan. "It's just been the hardest time, and we're just kind of coming up for air," the actress told Vanity Fair, adding that her kids had "been very brave" through it all. "We're all just healing from the events that led to the [divorce] filing," she continued. "They're not healing from divorce. They're healing from some…from life, from things in life." After moving herself and her children into the former Los Angeles residence of filmmaker Cecil B. DeMille, Jolie told The New York Times, "[My kids] really help me so much. We're really such a unit. They're the best friends I've ever had. Nobody in my life has ever stood by me more." Jolie is a longtime activist devoted to using her celebrity to foster real global change. After becoming a UNHCR Goodwill Ambassador in 2001, she began to dedicate much of her time to humanitarian efforts, including raising awareness for refugees, advocating for legislation to provide aid to child immigrants, and doing environmental conservation work through the Maddox Jolie-Pitt Foundation. Having gone on dozens of field missions around the world, Jolie was promoted to Special Envoy at the UNHCR in 2012. In this more diplomatic role, she refocused her energy on international refugee crises. "Above all, [my late mother] was very clear that nothing would mean anything if I didn't live a life of use to others," Jolie explained while accepting the Jean Hersholt Humanitarian Award the following year. "I didn't know what that meant for a long time … It was only when I began to travel, and look and live beyond my home that I understood my responsibility to others." She continued, "I have never understood why some people are lucky enough to be born with the chance that I had … And why across the world there's a woman just like me … only she sits in a refugee camp." "I don't know why this is my life and that's hers," Jolie concluded. "But I will do as my mother asked, and I will do the best I can with this life to be of use." Angelina Jolie further expanded the scope of her humanitarian work by co-founding the Preventing Sexual Violence Initiative in 2013. The U.K. governmental campaign fought to end sexual violence in military conflict zones. Two years later, she launched the Centre on Women, Peace and Security, Europe's first academic program to target this issue, at the prestigious London School of Economics. In 2016, the activist became a visiting professor in the center's multidisciplinary graduate course. According to the university's website, it focused on "the ways in which women and gender are understood in relation to, and affected by, regional, national and global peace and security processes in conflict and post-conflict setting." "I am very encouraged by the creation of this master's program," Jolie stated at the time of her professorial appointment (via the Independent). "I hope other academic institutions will follow this example, as it is vital that we broaden the discussion on how to advance women's rights and end impunity for crimes that disproportionately affect women, such as sexual violence in conflict." After catching the directing bug, Jolie surprisingly revealed that she'd considered quitting acting altogether. "Acting helped me as I was growing up. It helped me learn about myself, helped me travel, helped me understand life, express myself, all those wonderful things," she told Vanity Fair in 2010. However, she added, "But I don't think I'll do it much longer." During an interview with DuJour four years later, Jolie explained that she simply felt much more artistically fulfilled when directing. "I've never been comfortable as an actor; I've never loved being in front of the camera," she said. "I didn't ever think I could direct, but I hope I'm able to have a career at it because I'm much happier." Ultimately, directing had offered the actress a newfound sense of purpose in her work. "Directing is very different from acting because it takes more than two years of your life," Jolie said, explaining that she was "absolutely" sure in her resolve to focus more on film-making in the future. "So it has to matter — really matter — in a different way." Angelina Jolie may have spent much of the 2010s out of the spotlight, but it looks like her film prospects, both on screen and behind the scenes, are finally shifting back into place. In 2017, Jolie directed Netflix's critically acclaimed movie, First They Killed My Father, which earned an 88 percent approval rating on Rotten Tomatoes. Meanwhile, she is set to reprise her titular role in Maleficent 2, which will film in London throughout the summer of 2018. Following this, the actress will voice an elephant named Stella in the Disney adaptation of Katherine Applegate's award-winning book, The One and Only Ivan. At the time of this writing, it's unclear whether the multi-talent plans to keep up her acting career once these projects wrap or focus solely on directing. But based on her history, as Jolie remains focused on her family, her health, and her various humanitarian efforts, it sounds like anything she does decide to do in the entertainment industry will be entirely on her own terms.